Cateye Snake Straps have become popular because of their fine weave, that the strap is a little thinner and smoother than others and it's loud colors. 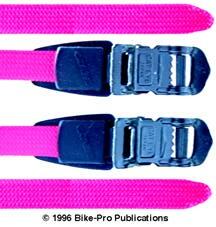 The Snake Strap is 16 1/2" long, made of woven Nylon that is unusually smooth. Both ends of the strap are heat seared to prevent unraveling. The buckle is made of dark stamped steel, and will permit the strap to be used in a fixed position or to allow the rider to use it dynamically, opening the strap with a fingertip motion and closing the strap with a slight tug. The Snake Strap also has a rubber sleeve that the shoe from abrasion and permits any extra length of strap to be held down. Snake Straps area available only in Black. The weight of a pair of Snake Straps is 54 grams. No longer made, we sold these for $6.99 a pair.